When it comes to pasta, I frequently prefer recipes with little or no sauce. Olive oil (or butter) with a few flavours is how I like to roll. A few staple ingredients, along with some good quality dried pasta, can form the basis of a kingly meal. 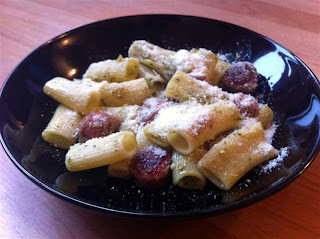 Supper tonight was a simple mix of rigatoni pasta, oil, garlic, basil pesto, Italian sausage and parmesan. Bring some salted water to the boil and cook the rigatoni until al dente. When ready, strain off the cooking water, making sure to reserve a few spoonfuls in case you want to want to add some liquid to the pasta later. Toss the pasta with oil and out aside until needed. In the meantime, gently sautee some onions and garlic. Get some Italian sausage (we purchased ours from our excellent local butchers, Lawlor's on Rathmines Road Upper) and cut into chunky slices. Fry these with the onions and garlic until cooked. Toss this mixture with the pasta and a spoon of good quality basil pesto, adding more oil if required. Serve with parmesan and enjoy!